The three finalists in the international design competition launched by the Detroit Institute of Arts (DIA) and Midtown Detroit, Inc. (MDI) in collaboration with twelve Cultural Center partners, will present their concepts at the DIA on Wednesday, January 23 from 10 a.m.–5 p.m. in Rivera Court. The event is free and open to the public. 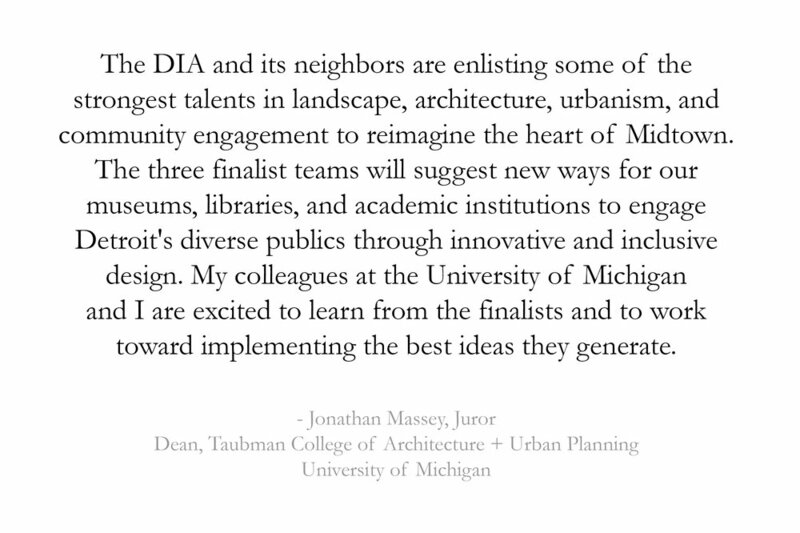 The date also marks the opening of the A New Vision for Detroit’s Cultural Center: The DIA Plaza/Midtown Cultural Connections International Design Competition exhibition, featuring the three finalist design teams’ proposals, which will be on view at the DIA until April 1, 2019. Left to right: Harley Etienne, University of Michigan; Jean-Louis Farges, Akoaki; Cezanne Charles and John Marshall, rootoftwo; Olivier Philippe, Agence Ter; and Anya Sirota, Akoaki. Left to right: Jha D. Williams and Michael Murphy, MASS Design Group; Nathan Adkisson, Local Projects; and Maura Rockcastle, TEN x TEN. Students from around the state of Michigan are invited to imagine the future of Detroit’s cultural district in Midtown at a Student Design Summit that kicks off Sept. 24 at the Detroit Institute of Arts (DIA) at 5:45 p.m. Currently enrolled high school, college and university students will be challenged to come up with ideas on how to help connect the 12 cultural and educational institutions in the district as well as to imagine the role of the DIA and cultural district far into the 21st century. The event is part of the DIA Plaza and Midtown Cultural Connections Competition. The summit is being led by A. Paul Fontaine of the Michigan Engaging Community through the Classroom Initiative at the University of Michigan, in partnership with Wayne State University (WSU), University of Detroit Mercy (UDM) and College for Creative Studies (CCS), with the DIA and Midtown Detroit Inc., as sponsors of the program. The international design competition launched by the Detroit Institute of Arts (DIA)and Midtown Detroit, Inc. (MDI) to unite 12 cultural and educational institutions, creating a connected cultural district and a town square for the surrounding neighborhoods, has reached another important milestone. Three urban and landscape design teams have been selected as finalists in the competition. Each team includes Detroit-area firms as partners. Agence Ter, Paris, France. Team partners are Akoaki, Detroit; Harley Etienne, University of Michigan; rootoftwo; University of Michigan and Detroit; and Transsolar | KlimaEngineering, Germany. Mikyoung Kim Design, Boston. Team partners are James Carpenter Design Associates, New York; CDAD, Detroit; Wkshps, New York; Quinn Evans Architects, Detroit; Giffels Webster, Detroit; Tillett Lighting Design Associates, New York; Cuseum, Boston; Transsolar | KlimaEngineering, Germany; and Schlaich Bergermann & Partners, New York. TEN x TEN, Minneapolis. Team partners are MASS Design Group, New York; D MET, Detroit; Atelier Ten, London; Local Projects, Boston; HR&A Advisors, New York; and Dr. Craig Wilkins, University of Michigan. If you cannot attend the presentations in person at the Detroit Institute of Arts, watch them online on our Facebook Event Page. You can even submit a question to ask the design teams during the Q&A session! The Facebook Live Event will begin by 9:00 a.m. each day. Go to the Live Stream NOW. It is not too late to register for the free and public presentations of the 8 semi-finalist design teams. Presentations will be held at the Detroit Institute of Arts Danto Lecture Hall (5200 Woodward, Detroit 48202) beginning Wednesday, June 13, and ending Thursday, June 14. CLICK HERE to register for the presentations. Congratulations to the 8 semi-finalists! Thanks to all the individuals and firms who submitted their qualifications to be considered for the DIA Plaza | Midtown Cultural Connections project. The Call is now closed -- no new applications will be accepted. All applications that are in progress in Slideroom have till Wednesday, May 2, 11:59 P.M. E.D.T. to submit. We will be announcing the finalists before the end of May. Thanks again to everyone who took the time to apply -- we appreciate you. You asked for it — you got it! All responses to the RFQ must be started by 11:59 p.m., EDT, Monday, April 30, 2018 in the Slideroom portal. All applications that get started before this deadline will have a 48 hour grace period for completion. This means that any application that is started before the April 30, 11:59 p.m. EDT deadline, will have till Wednesday, May 2, 11:59 p.m. EDT to fully complete their submissions. New applications will not be accepted during the grace period. Thank you! The FAQs about our RFQ process have been published. Thanks to all the firms who submitted questions! Our responses have been posted HERE, or a PDF of the FAQs can be downloaded HERE. For those firms still interested in applying, you can start your application in Slideroom HERE. All responses to the RFQ are due 12:00 p.m. noon, EDT, Monday, April 30, 2018. Any questions re: the use of Slideroom can be directed to Annmarie Borucki at aborucki@midtowndetroitinc.org. The deadline for firms to ask questions in response to the RFQ has been extended from April 16 to April 23, 2018, 5:00 pm EDT. Answers will be published no later than April 26. All questions and communication should be submitted to Dan Pitera at piteradw@udmercy.edu.